Vector tiles are fast being adopted as the preferred option in viewing and transferring geographic data in desktop GIS and web mapping applications. But, what are vector tiles and how do they differentiate from other approaches to presenting large collections of geographic data? Vector tiles are a bundles of geographic data that have been trimmed to a specified location, which is usually rectangular in shape. This is packaged into a collection of tiles for viewing on a desktop platform or web mapping application. In comparison with raster image tiles, vector tiles are able to lever the power of map tiling caching, scaling and processing speeds, while using vector data rather than pre-rendered raster image data. Several advantages exist in the use of vector tiles over that of pre-rendered raster image tiles. One primary advantage is that the data transfer in a map view is significantly reduced. Vector data usually is of much smaller file size than a rasterised image, hence overall package size can be greatly reduced when transferring or hosting the map tiles. 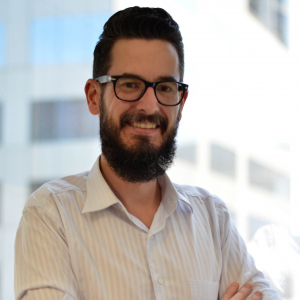 This can be of particular importance when displaying over cloud or web based applications, due to a lower download amount required. Vector tile size also helps with the speed of use and the scalability of the view. This adds a fluid and dynamic nature to the use of a tile package, providing quick mapping transitions when zooming and panning about a map layer. This is only limited by the speed of the computer or the download speed of the internet connection. 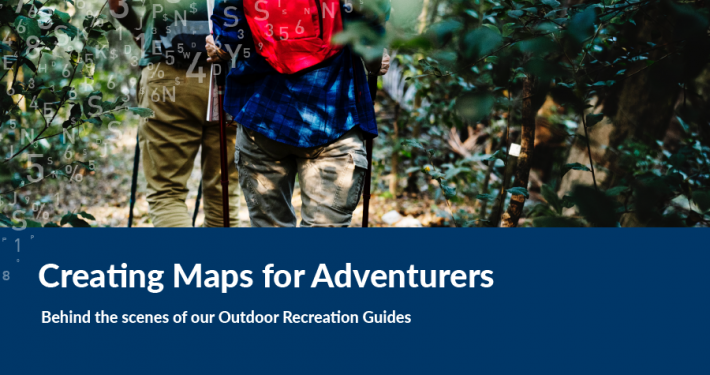 Lastly, as the underlying data is vector based, it can be possible to alter the style or theme of a map tile package in the mapping style sheet, which is not possible with raster image tiles. This allows for a user to alter the view of a tile set, allowing for many map styles to be created based off user preferences. 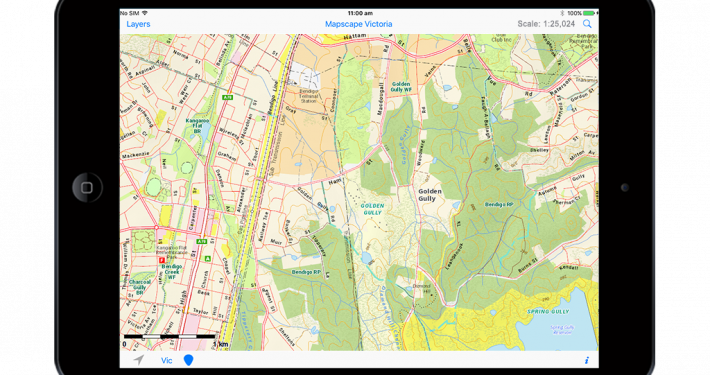 Many organisations that supply and display desktop GIS packages and web mapping applications make use of vector tiles. Google Maps and Open Street Maps have long since moved into using vector tiles in presenting web maps and supplying large map datasets. Other online services, such as MapBox, allow for online cloud based user focused processing and serving of vector map tiles. See the difference between vector and raster tiles on the sites below. 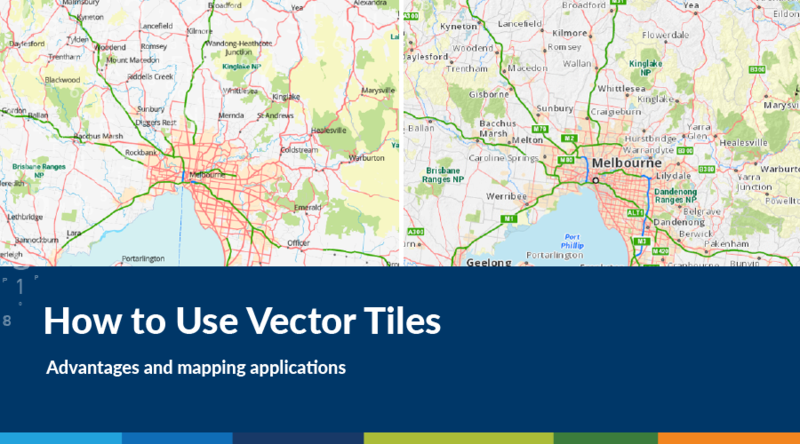 For desktop based applications, ESRI through their new ArcGIS Pro software package, has included the ability to generate vector tiles from large volumes of data into Vector Tile Packets (VTPK). This is able to be used within the ArcGIS Pro platform for a variety of desktop based mapping applications, or supplied online through ArcGIS Online and ArcGIS Portal. Spatial Vision is now in the initial phases of developing MapScape for Vector Tiles for use in ArcGIS Pro platforms and for online hosting. 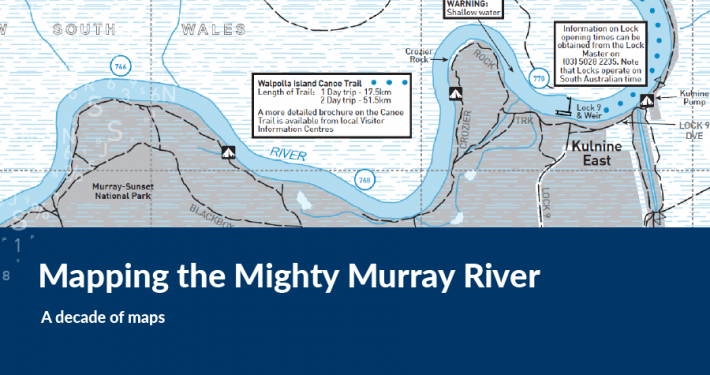 The current 8th Edition of MapScapeVictoria, released in August 2017, has been processed as a raster image tile package. But there is the possibility that this can also be produced into a vector tile package. Vector tile testing is being done at the Australia scale using GA250k (Geosciences Australia, Digital Topographic Data) data for a limited dataset and zoom range. But early indications and comparisons illustrate that vector tiles produce a cleaner map image that is quicker to load and view and more intuitive in its use (Figure 1). While testing and styling has be limited to a select range and scale of data, a few key advantages have been identified between vector tiles and raster image tiles. The dynamic and changeable nature of vector tiles means that place name labels scale and adjust seamlessly between zoom levels while raster image tiles do have a slight lag time while zoom levels load. Speed has also been noted as a key differentiation in zoom and panning transitions (Figure 2). Importantly, since vector tiles make use of vector data, a layer view retains a clean line view no matter the scale. This can be limited to the input vector data and the scale of use, as some early indications show in Spatial Visions testing (Figure 3 left panel). But in comparison to raster image tiles (Figure 3 right panel), there is no rasterisation in a close up view. The tile image is not pre processed, so data is able to dynamically scale to the zoom level and extent. Spatial Vision is currently evaluating the effectiveness of Vector Tiles with our Victorian Emergency Services clients. A demonstration product has been produced with user testing underway. Results and other usability feedback from this demonstration will be used by the Spatial Vision team to explore the capabilities that Vector Tiles could improve with our mapping products in the future.